Dr. Watson, a former Professor of English and Engineering at Fenn College, initiated and from 1940 to 1970, taught a pioneer course in the History of Civil Engineering. 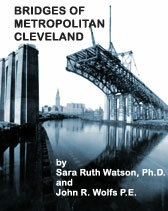 In 1983 she donated The Wilbur and Sara Ruth Watson Bridge Book Collection to the Cleveland State University Library. This is the web edition of a book originally published in 1981 by the authors with support from many patrons and sponsors. It contains all the information and images found in the original along with some enhancements developed to aid in navigating this site.